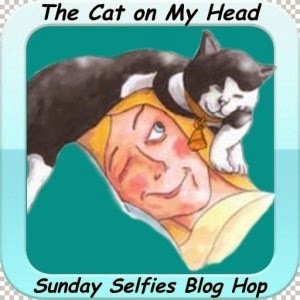 I'm joining my pals over at The Cat on My Head with a great selfie I took with a little help from my Dad yesterday. And then I had this great card from my pals from Love is owned by a Husky for my Birthday which I just had to show you.Thanks guys! teehee...you bunnies, you eat TREES! I have seen bunnies in my garden eat whole branches and I never knew you all were capable of that! HAPPY BIRTHDAY SPEEDY, all weekend long! You had an exciting week and capped if off with a great selfie. I'm glad to see you're feeling better, eating a bit more, and getting out. Naughty dad was sneaking you treats, and I'm sure you both enjoyed that but it sounds like there were a few too many treats and too few walks outside to burn off those extra calories. Now that you're feeling better maybe you can get out more and get in some good hopping and exploring. We know that the apple twig is GOOD fur your teefs. Hope you enjoyed it buddy. Dude that was a pawsome selfie. Have a serene and easy Sunday. 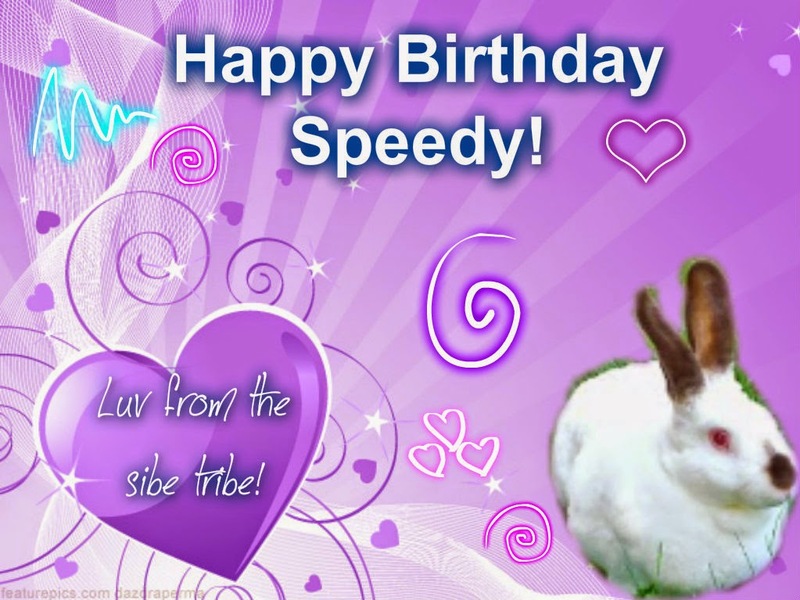 Happy Birthday Speedy! So happy to see you back on your paws! Enjoy the twig :) Great selfie! Happy Birthday Sir. Speedy. You are soooooooo very cute. Great picture of you. Awww, Speedy, you sure look happy in your selfie. So cute! Happy Birthday new friend. You sure are a cutie. M wants to give your sweet little nose a kissy! I wouldn't let her if I were you cuz she's slobbery! you and your Dad did a great job! That twig looks tasty...well, not really,but we are being polite because we don't know bunny etiquette. That is a great selfie Speedy. I hope you are improving every day. That is a fun selfie Speedy! Oh so glad you liked your card Speedy!!! Sowwy we missed yer Birfday; so HAPPY BIRFDAY!!!! We were doin bloggiez when da alarm went off n so now we lost more hourz...we neber gonna get cott up!!! Sorry for missing the Big #3 but HAPPY BIRTHDAY SPEEDY now!!! And eat better and feel better too! Wow...that is a pawsome selfie Speedy!! Happy Birthday, Speedy. We heard you hadn't been feeling too well and have been sending you purrs. Glad to read you're feeling better. That's an excellent selfie, too! >>Smoochies<< from all of us kittehz at Angel Prancer Pie. Lovely selfie, Speedy. Belated happy birthday! that's the cutest selfie ever! I love your nose! and the card is just wonderful, purple what means it is for a king! nice to see you playing! Wow, great job playing tug-toy with that twig! That's always a fun game. My crabby girls would like to pinch and munch on that too. BOL Happy Monday! Nice selfie Speedy. Your fur looks like velvet. And .. thank you ! We learned a new word today : twig. Wonderful selfie and great to see you being cheeky!